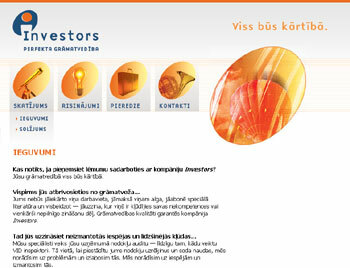 Investors is a provider of bookkeeping services. 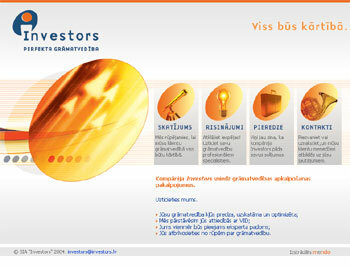 Investors takes care of its customers’ accounting records. The Internet society mendo has developed a website that will serve as a powerful marketing tool to attract new customers. The ideograms used in the navigation of the website visualize the principles of information structuring. At the beginning, there is the vision of the world (a telescope), followed by ideas about solutions (a lamp), experience of other customers (a briefcase), and finally – contacts. Art is everywhere! Who said that accounting is boring and monotonous? The Internet society mendo has developed a website that sheds a new light on the boring and the monotonous. Get rid of the excessive load (accounting), delegate it to professionals, and you’ll see how wonderful, generous and perfect the world is! The website has been created considering the corporate style and the geometrical patterns implied in the company’s logo. Orange colour and oval geometrical forms are reflected in all the sections of the site.